Here is a cheesecake with a little flair. 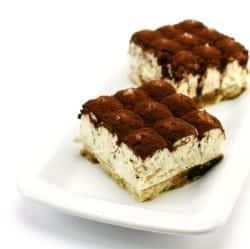 The rich coffee flavor of tiramisu combined with the decadent taste of cheesecake. Combine the rich flavors of Tiramisu with cheesecake for the perfect dessert. Mix together cream cheese, sugar and vanilla, at medium speed with electric mixer until well blended. Add eggs one at a time into well blended. Blend in brandy. Arrange ladyfingers on bottom and sides of a 9-inch pie plate; drizzle with coffee. Pour cream cheese mixture until pie plate. Bake at 350 degrees for approximately 1 hour. Cool. Refrigerate 3 hours or overnight. Garnish with Cool Whip topping before serving. This was so good! Very easy to make.